Capt. Robert Killian, left, and Staff Sgt. 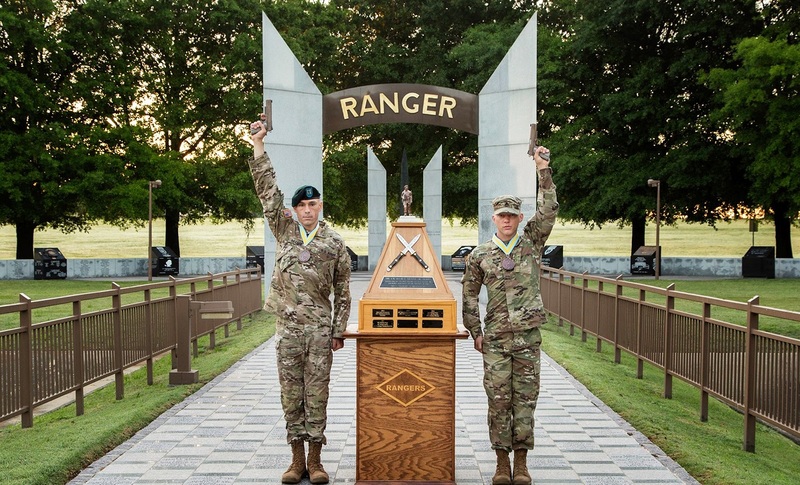 Erich Friedlien, Army National Guard, raise their pistols next to the winning team trophy at the 33rd Annual David E. Grange Jr. Best Ranger Competition at Fort Benning, Georgia. The 33rd Annual David E. Grange Jr. Best Ranger Competition started on April 15, with 50 two-man buddy teams competing to be the best of the best at Fort Benning, Georgia. The 60-hour grueling competition is known to quickly attrit the competing teams to a much smaller number and this year’s competition results met that prediction. Capt. Robert Killian and Staff Sgt. Erich Friedlien, representing the United States Army National Guard, won this year’s competition. 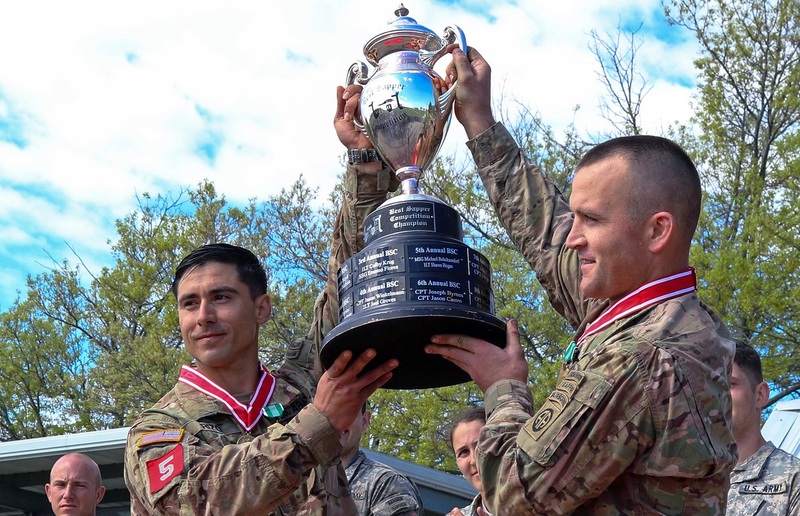 The Killian-Friedlien buddy team victory is the first time in the 33-year history of the competition where the United States Army National Guard has won. This accomplishment is a reflection of the high quality citizen soldiers who volunteer to serve our nation every day. For Killian, this accomplishment was far more than a victory; it was a culminating event after competing five times over the years and receiving two second place finishes. Both second-place finishes for Killian came in 2014 and 2015 in the 31st and 32nd competitions. This year his persistent hard work, dedication and quest to be the best came to fruition as the Killian-Friedlien team finished the final event – the Buddy Run at Camp Rogers. Killian hails from Colorado, where he serves in the Colorado Army National Guard as the detachment commander with B Company, 5th Battalion, 19th Special Forces Group (Airborne). Friedlien is from Pennsylvania, where he serves in the Pennsylvania Army National Guard. 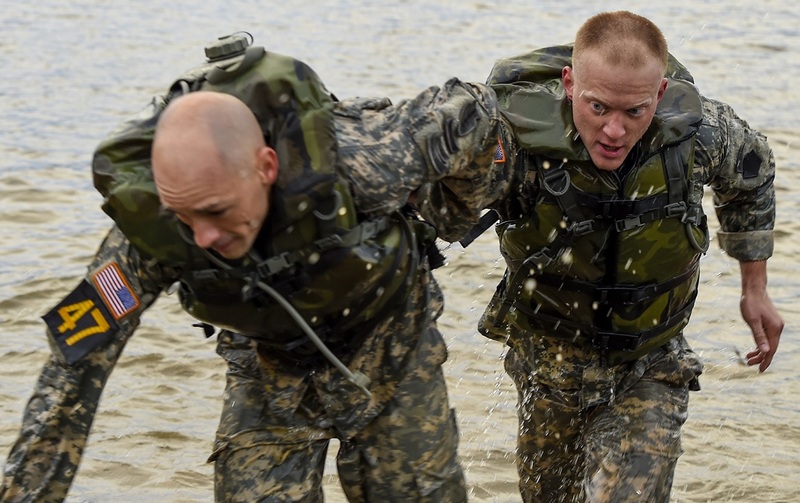 The Killian-Friedlien buddy team crosses the finish line to win the three-day Best Ranger Competition. This is the first time in the competition’s 33-year history that an Army National Guard team was victorious. The buddy team duo began training for this year’s competition in January. As a world-class endurance athlete, Killian felt the experience gained from past competitions was their greatest asset going into this competition. “I am hoping a big thing that will give me an advantage over other competitors is my overall knowledge,” Killian said. Killian added, “The more you do it, the more you develop techniques that get you faster,” he said in an interview at the start of the competition. Based on the performance of the Killian-Friedlein buddy team, this knowledge coupled with their teamwork and physical, mental, technical and tactical skills resulted in an unmatched performance that is nothing short of outstanding. One of the key attributes of the Killian-Friedlein buddy team was their dedication and commitment to push each other until the very end of the competition where both the first and second place teams were within 12 points of each other. Going into the final event, the Buddy Run, Friedlein said they knew they were 3 points behind the leading team. “I wasn’t allowed to look back to see where the other guys were,” said Friedlein of his buddy team partner. “It’s a big thing for the guard and I’m humbled and honored to be the first,” Killian said. Both Killian and Friedlein were recognized during the awards ceremony following the event where they hoisted their two pistols high in the air for the traditional historic photo. In addition to the Killian-Friedlien buddy team, the United States Army National Guard’s second team in the competition finished in eighth place in the final standings. Finishing in second place was the buddy team of 1st Sgt. David Floutier and Staff Sgt. Joshua Rolfes representing the Airborne and Ranger Training Brigade. In third place was the Maneuver Center of Excellence team of Capt. Michael Blanchard and Capt. Brian Slamkowski. All three teams had outstanding performances throughout the competition, consistently maintaining one of the highest scores on each event. The competing teams were tested on their day and night land navigation skills, extended road marches, weapons firing, a host of obstacle course challenges, mystery tasks, and a plethora of technical and tactical tasks. In total, each buddy team competed in 26 planned events over the three day period racking up more than 100 miles of buddy team runs and land navigation tasks while carrying up to 80 pounds of equipment. In many ways, this competition represents what is expected of our very best soldiers in uniform who wear the Ranger Tab. These outstanding soldiers are trained to stand up against insurmountable odds and challenges and complete their mission. This competition is “super-tough” by design, and ultimately separates and identifies the very best soldiers of this elite group. 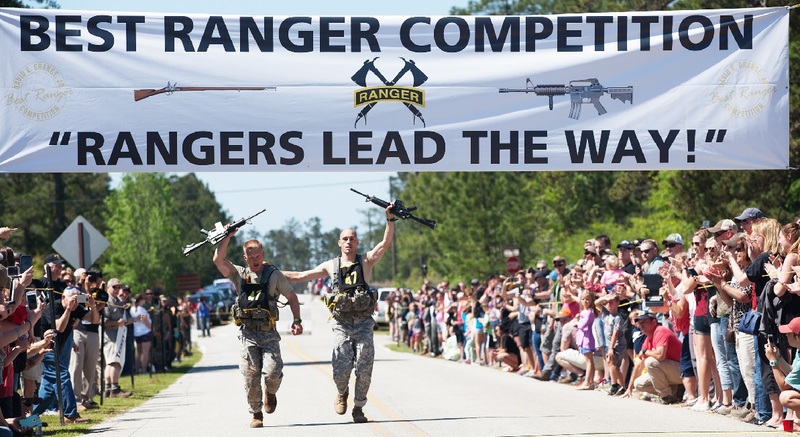 This competition is named in honor of Lt. Gen. David E. Grange Jr., a veteran of three wars, 20 campaigns and a former Ranger instructor, Ranger Department director and the commander of Fort Benning and Sixth U.S. Army. Patrick Murphy, the acting secretary of the Army, presented the awards to Killian and Friedlein during the ceremony. These professional development events are occurring every day around the Army and across the nation. If any of the discussions on professional development in this column, in AUSA News and ARMY magazine, on our webpage or in our social media coverage, then you need to be part of the our team and a member of the Army’s professional association. There is no substitute for the knowledge and wisdom gained through experience. When you are a young up-and-coming Army professional, associating with other members of your profession with varied experiences creates a unique opportunity to learn through the eyes of others. Kenneth O. Preston, USA, Ret.